I toyed with the title of this post for a while, and ultimately settled on the current iteration, because it reflects the battle that is being waged between the Bank of Canada and the forex markets. Simply, the Loonie is moving in one direction (up! ), while the BOC would prefer that it moves in the opposite direction. 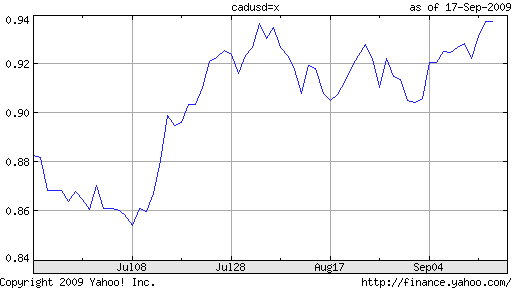 Let’s start with some context: the Canadian Dollar’s performance this year has been impressive, to say the least. 2009 is far from over, and yet the Loonie has already risen 14% against the Dollar, almost completely undoing the record 18% slide in 2008. Analysts are quick to point to the nascent Canadian economy, fading risk aversion, and the ongoing boom in commodities prices as behind the currency’s rise. While all of these reasons are certainly valid, they hardly tell the whole story. Consider that Canadian growth remains tepid, deflation is now a reality, its currency is outpacing commodity prices, and its budget deficit will probably set a record this year. Regardless of what the future holds for the Canadian economy, the present remains nebulous. Thus, it seems the best explanation for Loonie strength is not to be found in Canada, but across the border in the US. Specifically, it is US Dollar weakness, and momentum-driven speculation based on the expectation of further weakness, that is driving the Canadian Dollar. From the Bank of Canada’s standpoint then, the Loonie’s move back towards parity has nothing to do with fundamentals, which is why the BOC maintains that the currency represents a threat to both recovery and price stability. He has a point on the second front, since inflation is currently running at an annualized rate of -.8%, marking three consecutive months of deflation. “The [inflation information] has proved the Bank of Canada’s concerns are justified,” confirmed one analyst. The Million Dollar Question then, is how far the BOC is willing to go to halt the Loonie’s ascent. Bank of Canada Governor Mark Carnet has already intervened vocally, by repeatedly signaling his displeasure with recent developments in forex markets, and suggesting that all options remain on the table. But rhetoric only goes so far, and after a brief pause, the Canadian Dollar has resumed its rally. “We think [rumors of intervention] it’s 100 percent untrue. I don’t think the bank has the ammunition or the desire to intervene. This is a story about U.S. dollar weakness across the board,” said one trader. The Bank has already exhausted most of the tools in its monetary arsenal. It recently voted to maintain its benchmark interest rate at the current record low level of .25%, and beyond extending the period of time during which it maintains low rates, there isn’t much more it can do on this front. Besides, conveying an intention to hold rates at .25% beyond June 2010 might not influence investors, who don’t seem too concerned about low yields offered by the Loonie. Moreover, it remains loath to copy the quantitative easing implemented by the Fed and Bank of England, because of the tremendous amount of work required to mop up“that increase in liquidity when the time comes. In other words, the only thing the BOC can do at this point is to actually intervene, probably by buying US Dollars on the spot market. A couple obstacles are the fact that the BOC hasn’t intervened for over 10 years, and that Prime Minister Stephen Harper is simultaneously trumpeting the importance of “flexible exchange rates” in speeches intended to denigrate China. In fact, the BOC may not have to get involved, since the consensus among analysts is that the Loonie will trade sideways for the next year. “According to…52 strategists polled by Reuters…In three, six and 12 months, the median estimate of those polled had the domestic currency steady at $1.100 to the U.S. dollar, or 90.91 U.S. cents.” Moreover, polled analysts based their forecasts on a mere 17.5% of intervention, which means that irrespective of the BOC, most forecasters think that the Loonie has reached its potential…for now. Of course, if the Loonie fulfills estimates at the high end of the poll – especially in the short-term, and if inflation remains negative, the BOC could find itself with no other choice. But for now, investors aren’t holding their breath.